Pope Francis urged religious leaders to work together to reject war as he opened the first-ever papal visit to the Arabian Peninsula, the birthplace of Islam, with a strong denunciation of violence committed in God's name. Francis' speech to the gathering of faith leaders was the highlight of his 40-hour visit to Abu Dhabi. His trip will culminate Tuesday with the first papal Mass on the Arabian Peninsula, a gathering expected to draw some 135,000 faithful in a never-before-seen display of public Christian worship here. 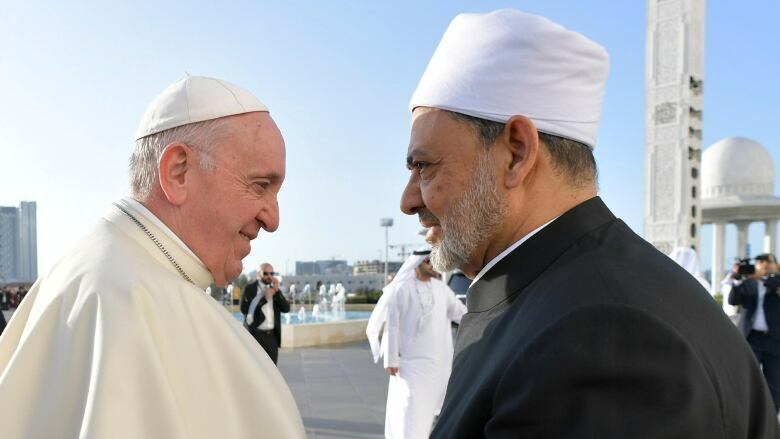 The Jesuit pope capitalized on his relationship with Sheikh Ahmed el-Tayeb, the grand imam of Egypt's Al-Azhar, the revered 1,000-year-old seat of Sunni learning, to make the historic trip. They found welcome in the Emirates, which prides itself on its tolerance in a region known for severely restricting religious freedom and is home to a remarkably vibrant Catholic community that by some estimates numbers one million faithful in a federation of nine million. As Francis began his trip, though, human rights groups that are banned from the U.A.E. urged him to use his visit to press for accountability by the Emirati leadership for atrocities in the war in Yemen and its repression of dissent at home. "Despite its assertions about tolerance, the U.A.E. government has demonstrated no real interest in improving its human rights record," Human Rights Watch said in a letter to Francis.